Isolated adrenocorticotropic hormone (ACTH) deficiency (IAD) is a relatively rare disease, but this disease is often reported in association with autoimmune disease, including Hashimoto's thyroiditis. , We report the case of a patient who presented with congestive heart failure caused by atrial fibrillation associated with IAD and Hashimoto's thyroiditis. This is the first report of the combination of these complex conditions. Atrial fibrillation with a rapid ventricular response itself can cause heart failure and an association with IAD would exacerbate a patient's condition. The clinical conditions in a patient with IAD and Hashimoto's thyroiditis can be variable, and it is sometimes difficult to establish a diagnosis. Therefore, making a proper diagnosis is necessary for improving the patient's prognosis. A 75-year-old female patient visited our hospital because of orthopnea, bilateral legs edema, and dyspnea on effort. The symptoms had been occurring since a month prior to admission. She had an 18-year history of hypothyroidism, for which levothyroxine had been prescribed. The physical findings on admission included bilateral pretibial edema and jugular venous distension without thyroid swelling. A third heart sound could be heard on auscultation, and a holoinspiratory crackle was detected at the base of both lungs. Her body temperature was 37.7°C; blood pressure, 116/91 mmHg; pulse rate, 160 beats/min and irregular; and oxygen saturation 95% when breathing room air. The remaining physical examination findings were unremarkable. Laboratory test results included the following: White blood cell count, 3400/mL (with a normal differential); red blood cell count, 340 × 10 4 /mL; hemoglobin level, 11.3 g/dL (normal range: 12.0-16.0); platelet count, 11.0 × 10 4 /mL (normal range: 15.0-45.0); and levels of sodium, 133 mEq/L (normal range: 135-147); potassium, 3.8 mEq/L; creatinine kinase, 356 IU/L (normal range: 43-146); glucose, 116 mg/dL; thyroid-stimulating hormone (TSH), 4.32 mIU/mL (normal range: 0.35-4.94); serum free thyroxine, 1.174 ng/dL (normal range: 0.70-1.48); antithyroid peroxidase antibody, 39.1 IU/mL (normal range: <10), antithyroglobulin antibody, 382.8 IU/mL (normal range: <50), brain natriuretic peptide 402.7 pg/mL (normal range: 0.0-18.4). An electrocardiogram revealed atrial fibrillation with a ventricular rate of 123 beats/min. A chest radiograph on admission revealed bilateral pleural effusion and pulmonary congestion [[Figure 1] a]. An echocardiogram revealed diffuse hypokinesis of the left ventricle with a left ventricular ejection fraction (LVEF) of 24%. Moderate-to-severe tricuspid regurgitation with a peak flow velocity of 2.8 m/s was also detected. The estimated right ventricular systolic pressure was 46 mm Hg. These findings were consistent with those for congestive heart failure. Intravenous infusion of isosorbide dinitrate, furosemide, and low-dose dopamine was immediately initiated. The patient's symptoms gradually improved, and the intravenous medications were gradually switched to carvedilol (10 mg/day), spironolactone (25 mg/day), and rivaroxaban (15 mg/day). 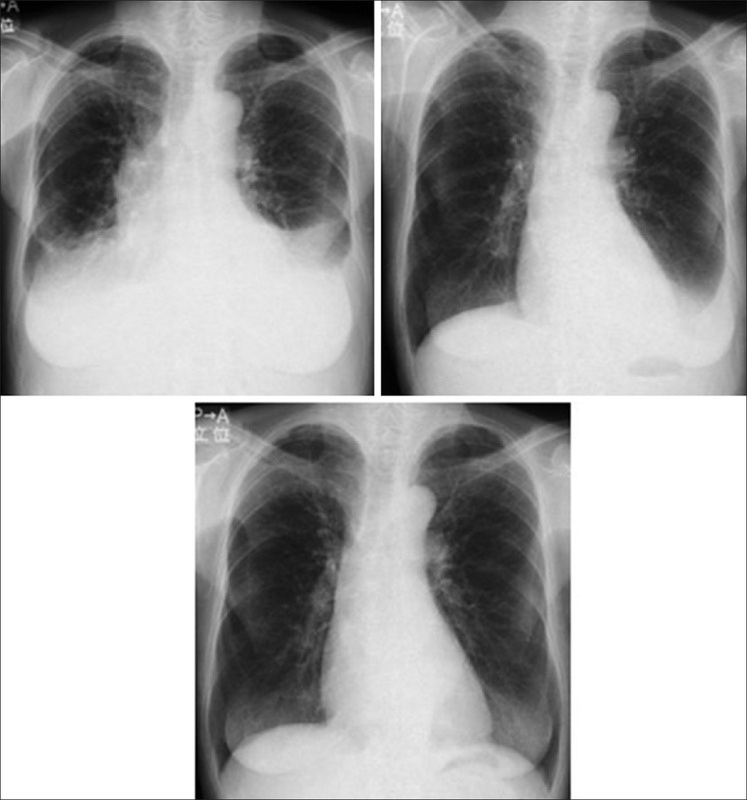 Two weeks after admission, her dyspnea had resolved, and pulmonary congestion was almost absent on the follow-up chest radiograph [[Figure 1]b]. However, her systolic blood pressure was approximately 60 − 80 mmHg, and she complained of dizziness and fainting. A coronary artery angiogram revealed normal artery status, and a repeat echocardiogram revealed an LVEF of 58%. We attempted to determine the cause of hypotension. cardiogenic, hypovolemic, septic, and neurogenic hypotension were ruled out. Pituitary-adrenal axis reactivity test evaluation was then performed. Serum concentrations of cortisol and ACTH were low [[Table 1]a]. There was little plasma cortisol response after a bolus injection of 0.125 mg of ACTH [[Table 1]b]. ACTH-releasing hormone did not sufficiently increase the plasma ACTH concentration [[Table 1]c]. 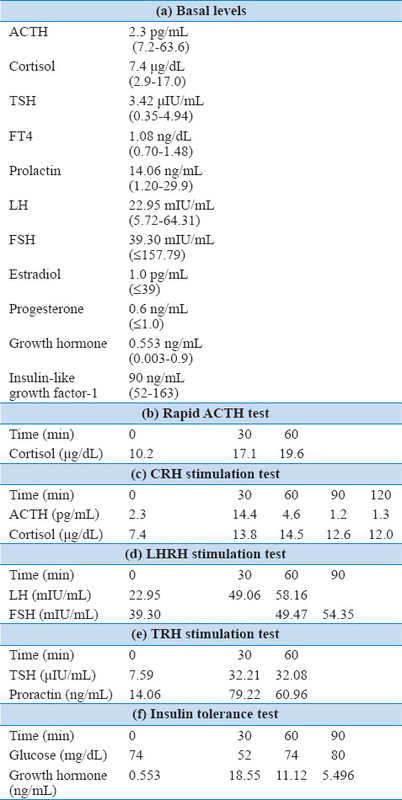 TSH, prolactin, luteinizing hormone (LH), follicle-stimulating hormone (FSH), and growth hormone levels were all increased by an infusion of TSH-releasing hormone, LH-releasing hormone, and rapid-acting insulin [[Table 1]d-f]. Although the LH and FSH levels were increased by LH-releasing hormone, their basal levels were high enough because of the patient's postmenopausal state, and we considered the LH- and FSH-releasing ability to be preserved. The TSH increase was excessive, which is consistent with the findings for primary hypothyroidism due to chronic thyroiditis. Plasma renin activity and aldosterone concentration were normal. Thus, a diagnosis of isolated ACTH deficiency was made. Magnetic resonance imaging revealed no pituitary lesions or adjacent lesions and antipituitary antibody testing was negative. Oral administration of hydrocortisone (15 mg/day) was then initiated and the patient's clinical symptoms such as dizziness and fainting gradually improved. Her chest radiograph revealed no abnormalities [[Figure 1]c]. Her systolic blood pressure was stable at 90 − 100 mmHg and she was discharged. In ACTH deficiency cases, the cortisol level decreases, and arginine vasopressin is released from the pituitary gland that binds its type-2 receptor to renal principal cells. The binding triggers an intracellular cyclic adenosine monophosphate signaling cascade that upregulates the expression of the aquaporin-2 (AQP2) gene and targets the channel to the apical plasma membrane. Then it impairs water excretion. In addition to ACTH deficiency, our patient had atrial fibrillation with rapid ventricular response. Tachycardia contributes to the dilation and thinning of the ventricular walls. In addition, decreased contractility and a rapid, irregular heart rate can result in increased sympathetic nerve activity. We speculate that these complex conditions caused the patient's congestive heart failure. Atrial fibrillation is a well-known common risk factor for heart failure. The risk of atrial fibrillation is closely associated with thyroid activity, with a low risk for hypothyroidism. Selmer et al., reported that among overt hypothyroidism patients, 2.5% developed atrial fibrillation in their cohort, whereas among euthyroid subjects, 2.9% developed atrial fibrillation. The overall age-adjusted incidence rates for atrial fibrillation were lower in patients with overt hypothyroidism than in euthyroid subjects. This cohort study results also indicated that the taking of methimazole slightly reduced the risk of atrial fibrillation among the hyperthyroid patients in a time-dependent manner, but taking levothyroxine did not significantly alter the risk among the hypothyroid patients. On admission, our patient had euthyroid status but was under levothyroxine medication. In this condition, the occurrence of atrial fibrillation is believed to be relatively rare, as that observed in our case. IAD is frequently associated with various autoimmune diseases and thyroid diseases are the most common among these autoimmune diseases. Hahner et al., reported that the incidence of atrial fibrillation is one of the triggers for adrenal crisis in patients with primary adrenal insufficiency. Atrial fibrillation itself could exacerbate the lack of glucocorticoid. This hypothesis is consistent with the fact that our patient had no symptoms of adrenal insufficiency before admission. Various conditions cause heart failure  , including autoimmune disease. In patients, complex conditions affect each other, eventually resulting in congestive heart failure. When clinicians diagnose a patient with heart failure, they should not be satisfied with the identification of one single cause but should attempt to identify the underlying conditions that may not be as obvious. We presented the case of a patient with congestive heart failure caused by atrial fibrillation associated with isolated ACTH deficiency and Hashimoto's thyroiditis. This is the first report of the combination of these complex conditions. The pathophysiology of heart failure sometimes cannot be easily explained, and it is important to diagnose the condition appropriately to improve patient prognosis. Hannon MJ, O'Halloran DJ. Isolated acquired ACTH deficiency and primary hypothyroidism: A short series and review. Pituitary 2011;14:358-61. Kasperlik-Za³uska AA, Czarnocka B, Czech W. Autoimmunity as the most frequent cause of idiopathic secondary adrenal insufficiency: Report of 111 cases. Autoimmunity 2003;36:155-9. Saito T, Ishikawa SE, Ando F, Higashiyama M, Nagasaka S, Sasaki S. Vasopressin-dependent upregulation of aquaporin-2 gene expression in glucocorticoid-deficient rats. Am J Physiol Renal Physiol 2000;279:F502-8. Selmer C, Olesen JB, Hansen ML, Lindhardsen J, Olsen AM, Madsen JC, et al. The spectrum of thyroid disease and risk of new onset atrial fibrillation: A large population cohort study. BMJ 2012;345:e7895. Murakami T, Wada S, Katayama Y, Nemoto Y, Kugai N, Nagata N. Thyroid dysfunction in isolated adrenocorticotropic hormone (ACTH) deficiency: Case report and literature review. Endocr J 1993;40:473-8. Hahner S, Loeffler M, Bleicken B, Drechsler C, Milovanovic D, Fassnacht M, et al. Epidemiology of adrenal crisis in chronic adrenal insufficiency: The need for new prevention strategies. Eur J Endocrinol 2010;162:597-602. Kajiya T, Kuroda A, Hokonohara D, Tei C. Heart failure caused by hookworm infection possibly associated with organic food consumption. Intern Med 2006;45:827-9. Kajiya T, Lee S, Yamashita M, Sasaki Y, Kamizono Y, Imamura M, et al. Peripartum cardiomyopathy in a patient with Graves' disease. Int J Cardiol 2010;145:e23-5.